This site operates a news service in order to disseminate information, most of which we hope can be positive and put to good use in the service of educating students, especially those in public schools in Maryland and Illinois. As a teacher and former journalist, I believe that good journalism, professionally edited and couched in an accurate historical context, can help people make good decisions that lead to better public schools everywhere. VOXITATIS MAKES NO WARRANTY AS TO FITNESS OF ITEMS PUBLISHED OR LESSONS DEVELOPED FOR ANY PURPOSE WHATSOEVER. PLEASE CHECK THE VALIDITY AND CORRECTNESS OF ANY MATERIAL YOU USE FROM OUR SITE. I believe that by presenting accurate and timely information to learners at more successful schools and at more problematic ones, those at all schools will be better equipped to develop and mature. Then, reporting stories from more than one perspective, or using an alternating journalistic beat, might shine new lights on issues everywhere. It will at least present viewpoints from different school leaders, students, or parent groups. At the same time, however, Voxitatis doesn’t plan to have an unlimited supply of news-gathering resources. Therefore, I have narrowed our mission to only two jurisdictions, Illinois and Maryland, and made a home for this organization. We will occasionally branch out to schools in other states or countries if we believe a story is worth sharing. Contact us by email at paul@schoolsnapshots.org. This is the preferred form of communication. Contact us by phone at (630) 863-5871. Please leave a message. Our mailing address is 100 International Drive, Suite 2300, Baltimore, MD 21202. This blog and any news stories, except as noted, are licensed under a Creative Commons Attribution-NonCommercial-ShareAlike 4.0 International License. The Creative Commons license above gives you permission to reuse or reframe any material on this site created by or for Voxitatis, including words, pictures, videos, and artwork. However, some pictures we use carry third-party copyrights and cannot be reproduced without explicit permission from the original copyright holder. You are not allowed to copy these materials. If you have any questions, please contact us directly. Websites that share news stories usually raise most of their revenue from ads. We will not do this, as selling ads would compromise our independence as journalists. Our organization will be too small to erect a sufficient wall between advertising sales and editorial content creation, so we essentially give up this battle before it begins. I also believe in providing kids with as commercial-free a childhood as possible. There’s a place for commerce, like on Facebook, but that place isn’t on Voxitatis. The meaning of the model. 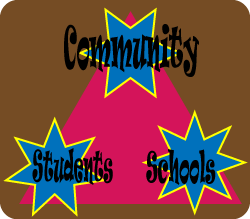 After many, many years, I have come to view school improvement as an equilateral triangle with these vertices: our students; our schools, including teachers, administrators, support staff, unions, public and private, traditional and charter; and our communities, including business both local and international, religious organizations, sports clubs, politicians, and families. The sides of the triangle represent the modes of engagement—not merely involvement—between those vertices. Many sites on the Internet feature stories of teachers, many other sites feature stories about students, and still others feature stories of politicians, think tanks, business leaders, or other opinion-hawking folk. Voxitatis is different. I have come to realize that all components of a quality education need to come together. The Internet is the perfect place to bring these people together to a place where everybody cares about the quality of education we provide for young people. In fact, there’s no better place than the Internet for this kind of collaboration. If members of the community (parents of sixth graders, for example) can be given accurate, useful information about their sons’ and daughters’ life at school (let’s say, the Common Core math standards), they’ll be better able to engage the other two points of the triangle. When creative, caring people put their minds together on the same task, there’s no limit to what solutions might arise. Parents might then work with their children on the types of problems they needed to learn and engage the school in more constructive dialog about how the school teaches that curriculum. Thus all three points, the components of quality education, are engaged. If, on the other hand, the school had no way to get accurate, up-to-date information to parents about the sixth-grade math curriculum (let’s face it: school Web sites and even those provided by state departments of education are restricted in terms of what they can publish), then there’s basically no hope that anyone could engage either students or schools in constructive dialog about what is ultimately everyone’s goal here: learning sixth-grade math. Schools, of course, have much more than a certain math curriculum to deal with, but the same philosophy applies: get accurate, timely information into the hands of people who care about the outcomes, and let their creativity go to work. Unless each point on the triangle grasps the concerns and challenges faced by the others—accurately, fairly, and with an attitude interested in helping—our students don’t have a chance of achieving at higher levels. Relationships of storylines to model. Given the news, we strive to inform schools, students, and community members in such a way that will stimulate their own discussions and debates. We don’t presume to know what’s best for schools in general, and certainly when it comes to charting a solution to a problem in a community in which we don’t have a truly vested interest, our plan is to stay out of the fray. For example, in the “Learning” category, we often report on lesson plans in the STEM disciplines of science, technology, engineering, and math, seeking good research in peer-reviewed journals to supplement the stories. Often, this gives us an opportunity to explore how one or several teachers are teaching that material to students. Objective, research-based reports will give learners in other schools and communities a chance to engage in their own debates and apply any solutions described in their own communities or classrooms as appropriate. We try to advocate not for specific positions on issues, but for a diverse range of perspectives on what makes education good for children. We all learn by asking questions in the context of real-world events in our schools and communities. These questions and this learning—on our part, our students’, and our larger communities’—can advance the true value of education more than any one set of answers anyway. I hope this learning can act to provide an education agenda that serves all children and helps them to realize their true, individual potential. Although many factors led to the development of a site like this one, I would have to say the primary inspiration was an idea given to me by Dr Doug Brooks, professor of education at Miami University in Oxford, Ohio. When I interviewed Dr Brooks in 2001, he painted a vivid picture for me in which students, schools, and communities form the vertices of an equilateral triangle. This was the basis for the model created for Voxitatis. We translate this model to the Internet because computers are very good at some things: graphics, games, databases, dissemination of information, online networks and communities, online “friends” and business contacts, etc. Teachers need to do what they were trained to do: inspire, educate, bring lessons to life with one-on-one instruction. Computers (e.g., Voxitatis) can take care of programming presenting what teachers believe is good information in an accessible format for all learners. See, I have no problem with technology companies that try to sell “personalized” instruction. I have no problem with tech companies that try to sell lesson plans. I think they’re short-sighted in terms of the amount of help they can actually provide real teachers or students in real classrooms, but I don’t think we should get in their way either. Maybe we can learn something from them. But bringing schools, students, and communities together to celebrate learning in the fine arts, academic subjects, and in athletics will take something more. That’s where I hope Voxitatis can play a role. I serve as executive editor and system administrator for all the websites operated by Voxitatis, and as chairman of the foundation’s board. I work at the Maryland State Department of Education in the Division of Curriculum, Assessment, and Accountability, and I have supervised the scoring of the Maryland School Assessment in mathematics and science, as well as the High School Assessment in biology, the Ohio Graduation Test, and the Illinois Measure of Annual Growth in English (for ESL students). I was formerly employed as a writer and photographer for a daily newspaper in west central Ohio; as the technical support manager for Wolfram Research, makers of Mathematica; as a database administrator for two mortgage companies; and as the information specialist for the Fellows Program at the John D and Catherine T MacArthur Foundation in Chicago. Catherina Webster began working with Chicago Voxitatis in June 2009 as a marketing specialist. Her ideas were vital to the launch of our electronic library of lessons and The Beautiful Blogs, which grew into the Answer Maryland idea at learnvox.org. As a parent of six school-age children in Illinois, she is intimately familiar with the need for open communication between families and school officials. She lives in Montgomery, Ill., and her insights through the years have made this organization what it is. Jennifer Johnson joined our board of directors when the Maryland foundation was created in November 2011. She works at Measurement Incorporated, an educational service firm that provides test-scoring services, among others, and her ties to the corporate world have given her valuable insights that she generously shares with our board of directors as we consider new directions. She lives in Durham, N.C., but she formerly worked at the Maryland State Department of Education, where she was the project manager for the Maryland School Assessment in science. Danielle McGarry joined Voxitatis in January 2012, as a recent graduate of Mount St. Mary’s University in Emmitsburg, Md. She holds a bachelor’s degree in English, with a minor in communications. She lives in Baltimore. Danielle handles a great deal of communication with teachers, schools, school districts, and parents, and occasionally writes or reports on featured stories, including the foundation’s Verbo de Verbo project. The word Voxitatis, which I made up, is a registered trademark. Over the years, many people have asked me what our name, Voxitatis, means. The answer is that it means, technically, nothing. It’s derived from two Latin words, vox, meaning voice or word, and aetatis, which is declined from the nominative aetas, meaning an age group or a generation. Therefore, since aetatis is the genitive of aetas, the phrase vox aetatis means “the voice (or word) of an age group or generation.” We usually pronounce the “ae” vowel combination in Latin as “eye,” so I simply changed it to an “i” when I combined the words. The name summarizes our mission: to listen to what students tell us about their schools and work with them to improve those schools for future generations. They do this by speaking, and their language is sometimes words, sometimes action, sometimes music or other art forms, and so on. We try to allow all these “voices” to speak on behalf of the schools, and that is where the name comes from.